© ISTOCK.COM/NANOSTOCKKIn 1977, biologist Carl Woese discovered that microbes living in anaerobic conditions and producing methane had a genetic imprint very different from known bacteria species. He and his colleagues eventually suggested that researchers stop referring to such methanogens and related microorganisms as bacteria, classifying them instead as members of a new domain in a tripartite division of the living world, alongside Bacteria and Eukarya. Woese named this domain Archaea (from the Greek archaio, meaning ancient or original) because the microbes he studied seemed to thrive in extreme conditions akin to those of early Earth. 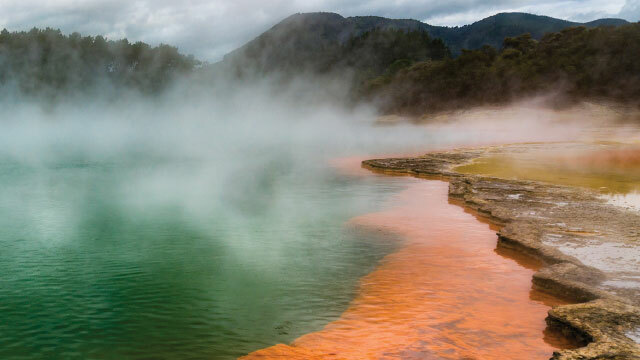 Later on, scientists observed archaea in more-diverse environments, from oceanic water and deep sediments to forest soil and the surface of human skin. Recently, a new archaeal group named after its discoverer, Woesearchaeota, was even detected in human lungs. Although archaea superficially resemble bacteria in terms of size and cellular organization (members of both groups lack nuclei), they are surprisingly similar to eukaryotes at the molecular level. For instance, all archaea replicate their DNA and synthesize proteins using molecular machines like those of eukaryotes. This suggests that Eukarya and Archaea belong to a same “super-domain” that one of us (P.F.) proposed calling Arkarya, and that eukaryotes share a common ancestor with archaea that existed much more recently than the separation of Arkarya and Bacteria. In other words, archaea would be our sisters and bacteria our cousins. Many new archaea species discovered in the past decade exhibit additional eukaryotic features, such as components of the cytoskeleton, but many of these are only present in one or a few archaeal subgroups. This indicates that these features were probably all present in the ancestor common to Archaea and Eukarya before being lost in some archaeal lineages. These ancient eukaryotic features were potentially replaced by bacterial ones over time in some archaeal lineages from frequent lateral gene transfer between archaea and bacteria living in the same environments. 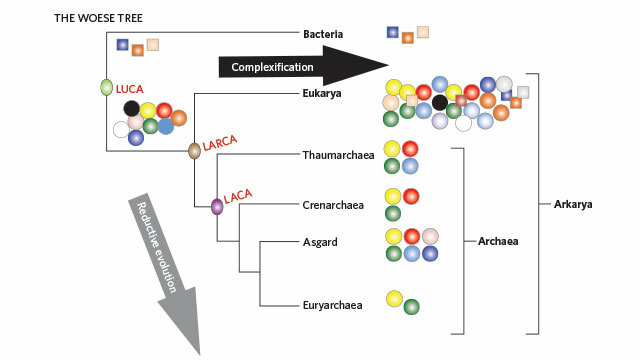 If this model is correct, the common ancestor of Archaea resembled eukaryotes more closely than any modern archaeon, and combining all eukaryotic features presently dispersed in Archaea should allow researchers to reconstruct the ancestor’s phylogenomic profile. Assuming that these shared archaeal/eukaryotic features were present in the common ancestor of these two domains, the profile would provide a starting point to picture how eukaryotes originated and evolved. Screening for new archaeal lineages with additional eukaryotic features is therefore crucial to get more information about our origin. Researchers are also seeking to understand the origin of the unique eukaryotic features missing in Archaea. One possibility is that some of them originated in the many lineages of large DNA viruses that coevolved with the ancestors of eukaryotes after their separation from the archaeal lineage. 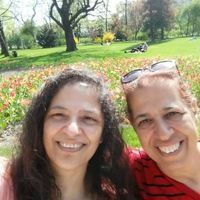 We suggested, for instance, that the nucleus evolved from nucleus-like factories that these viruses built in the cytoplasm of infected cells to protect their genomes (Curr Opin Micro­biol, 31:44-49, 2016). Over time, several researchers have proposed alternative evolutionary scenarios in which the eukaryotic features actually appeared and accumulated in some archaeal lineages before Eukarya eventually originated from a specific archaeal branch. These scenarios, which include the archaea ancestor hypothesis where an ancient archaeon merged with a bacterium, have recently been supported by universal trees of life (See THE EOCYTE TREE on next page) with Eukarya branching from Asgard archaea, which contain many eukaryotic features. (See “Archaea Family Tree blossoms, Thanks to Genomics,” here.) These models posit Archaea as the mother of eukaryotes, rather than a sister. Our data come to a different conclusion. Phylogenetic trees are built using universal proteins, which are conserved in the three domains of life. 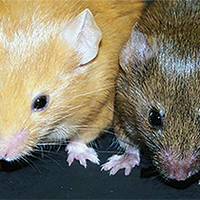 Recently, we showed that the results of such analyses are strongly dependent on the sets of proteins and species used. Avoiding artifact-prone elements from our analyses, we obtained a robust universal tree that did not support the archaeal ancestry of Eukarya but the sisterhood of the two domains instead (PLOS Genet, 13:e1006810, 2017; PLOS Genet, 14:e1007215, 2018). In our view, scenarios in which Archaea gave birth to Eukarya raise several difficult questions. For one, they imply that thousands of archaeal lineages remained similar to their ancestors during the last 3 billion years, whereas one was dramatically transformed into a new domain, the Eukarya. This seems unlikely because Eukarya exhibits many unique features absent in the two other domains. For instance, large DNA viruses that infect eukaryotes have no direct ancestors that infect archaea. Moreover, a few eukaryotic features, such as the nature of their lipids, remain more similar to those of bacteria. 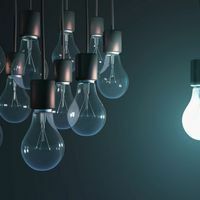 Deriving all these features from archaea requires proposing ad hoc scenarios that seem far from parsimonious, such as getting all of those characters directly or indirectly from the bacterium that engaged in the original endosymbiotic union. Considering archaea as eukaryotes’ ancestors also reproduces the common confusion of ignoring the evolution that takes place in two lineages after their divergence. This would be akin to considering chimps as humans’ direct ancestors. Humans and chimps share a common great ape ancestor that was neither one nor the other. Similarly, the last common ancestor of Archaea and Eukarya was most likely different from all modern organisms. 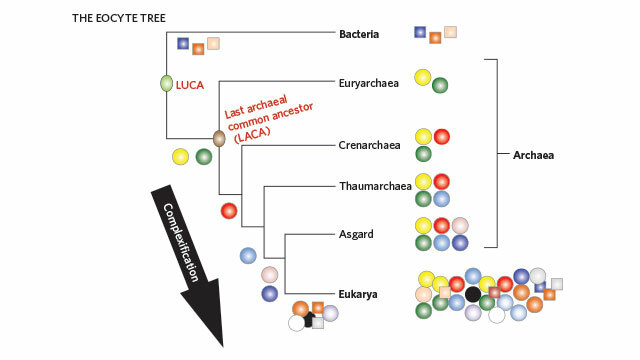 Interestingly, if archaea are indeed our sisters and not our mothers, one could imagine that some common features present in Bacteria and Eukarya have been inherited from the last universal common ancestor (LUCA) of all life and subsequently lost in Archaea. The identification of these features in already known organisms or in lineages of Bacteria and Eukarya yet to be discovered would be another important step in the reconstruction of LUCA, crucial to truly understanding the origin of life itself. 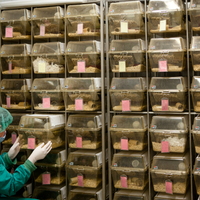 Patrick Forterre is a microbiologist at Institut Pasteur in Paris. Violette Da Cunha and Morgan Gaia are postdocs in his lab.